On the opposite side to Illetes is Llevant. It has the same white sand and turquoise water, is usually less populated than Illetes and as far as Formentera beaches go, its one of the better ones, with a long stretch of the powdery white stuff. Playa Llevante has fantastic clear water for swimming and is a great place to spend a day at the beach as it usually doesn’t get too crowded. There aren’t many facilities here apart from one restaurant at each end, and one in the middle of this lengthy beach, so bring a picnic and drinks with you. During peak season there is a manned lifeguard station at the southern end of Llevante. It can get quite rough here when the wind blows in off the sea, so if that happens, head on over to Playa Illetes. Playa Llevante is located on the north eastern edge of Formentera. 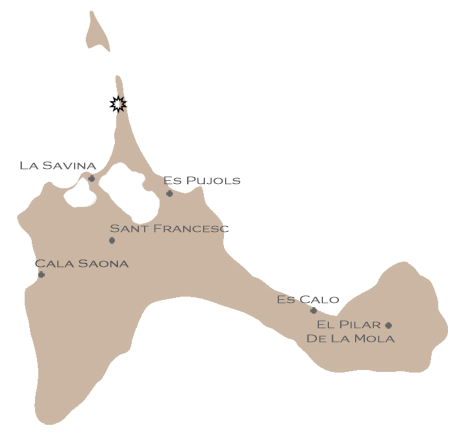 To get to the southern end of the beach, head out of Es Pujols on the road to La Savina, turn down the road next to the supermarket, opposite Estany Pudent, then turn left down the dirt road that runs past the Hotel Lago. Head all the way down and park in the car park outside the restaurant. To get to the northern end, use the signs for Illetes, and when you get to the restaurant at the end of the road, walk to the right to get to Llevante. 6 km to Playa Llevante. 8 km to Playa Llevante.